Although Palmer has now hung up his leathers, Cowton, one of the sport’s brightest young talents, will be back for another try, again mounted on one of Peter Berwick’s TZ250 Yamaha’s. He'll face tremendous opposition from two of the sport’s true stalwarts and most successful riders. Ten times TT winner Ian Lougher has a record that speaks for itself. The Welshman may have retired from the TT and other International road races but he remains a formidable competitor, particularly on the two-strokes where he made his name. 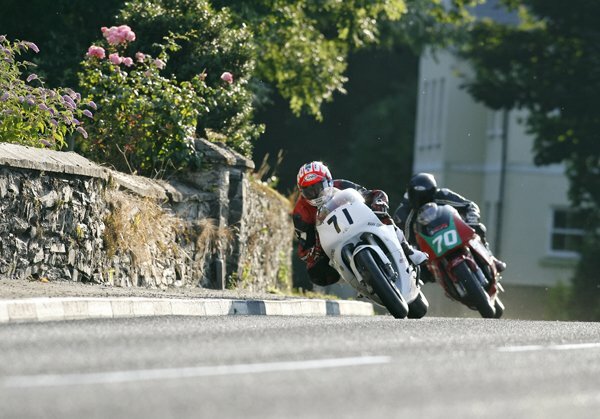 Classic racing legend Roy Richardson was forced to retire from last year’s race but won the corresponding event at the 2011 and 2012 Manx Grand Prix, lapping in excess of 111mph in 2011, so is sure to be challenging for the honours on the FCL Racing/Bullock Motorsport Yamaha. Phil McGurk, a regular on both the Classic scene and MGP, will certainly pose more than a threat on his Springcourt Motorcycles TZ Yamaha having finished third last year with the similarly mounted Chris Moore, fourth in 2013, also likely to challenge. Stuart Garton is always a force to be reckoned with in the class on the Haskell and Co 250cc Yamaha while regular TT competitors David Hewson (250 Obsession Engineering Yamaha) and Grant Wagstaff are also likely to be in the mix, the latter on one of the few TZ350 Yamaha’s on the entry list. Tom Snow, on a second FCL Racing/Bullock Motorsport Yamaha, is also expected to feature. 2012 Supertwins Manx Grand Prix winner Nigel Moore cannot be ruled out on his OW47 250cc Yamaha with class regulars Ewan Hamilton, Neil Chadwick, Chris Barratt, Dean Martin and Tom Jackson just some of the other riders in the 30-strong field. It’s not all about the two-strokes though with a handful of four-strokes in the field, most notably four GPZ 600 Kawasakis in the hands of TT ace Shaun Anderson, Derek Glass, Stuart Noon and Peter Gibson.